Salad Bar!! The cafeteria staff, under the leadership of Ms Lowney, is very eager to work with Youth CAN students. Ms Lowney met with students last year and suggested the very exciting possibility of eventually converting the under used faculty lunchroom adjacent to the kitchen into a salad bar where cafeteria staff could serve fresh produce grown in the green house (supplemented by local farm food of course.) We subsequently entered the Great American Salad Bar Project and won a salad bar valued at $3,000, which BLS Youth CAN will be working with BLS Dining Services staff to get up and running. The contest was sponsored by the Food Family Farming Foundation and the salad bars are subsidized by Whole Foods. 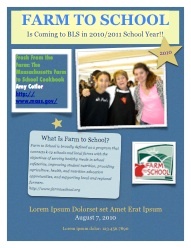 BLS Youth CAN students have partnered with Jessica Krane, a local chef and nutritionist, and have begun meetings to develop a plan for improving school lunches. See our notes from the meetings here. Click here for Jessica Krane’s webpage. 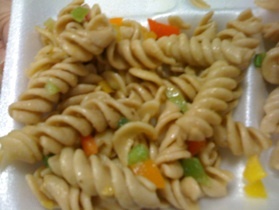 We entered Michelle Obama’s Recipes for Healthy Kids Challenge with an original pasta salad recipe created by a BLS Youth CAN Team in partnership with a local chef. See our recipe here. 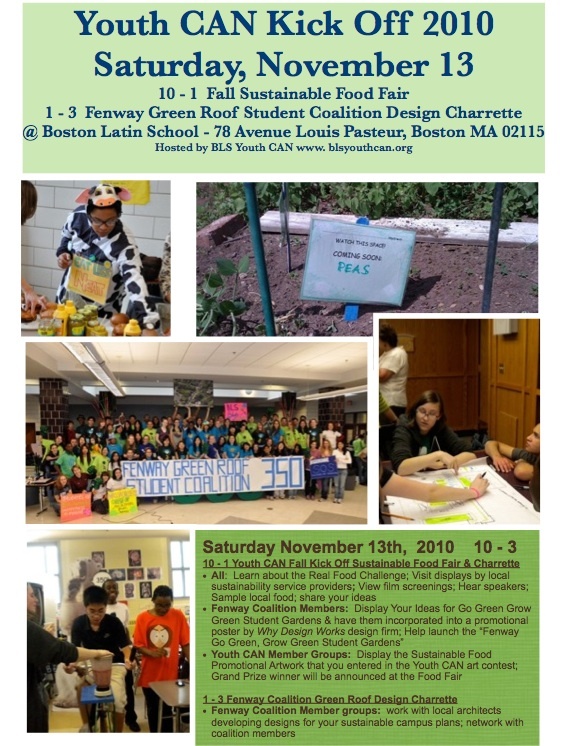 BLS Youth CAN’s decision to devote more attention in the 2010/2011 school year to food and sustainability related to food at BLS was in part informed by a couple of great Youth CAN field trips. 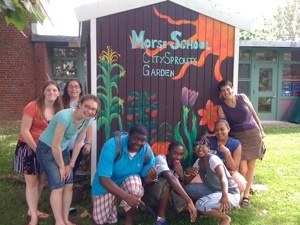 Students had a very cool visit with Jane Hirschi of City Sprouts to visit a City Sprouts garden at the Morse School in June where the benefits of growing our own food became much clearer. 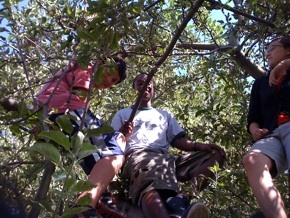 Students also had a fun field trip to the Boston Nature Center to learn about their new green roof with Bruce Fulford. 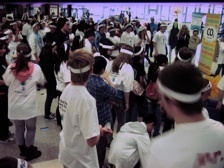 Both events inspired students to want to do more to raise awareness and change habits at BLS. Youth CAN will launch an early fall fundraiser though Equal Exchange, selling fair trade chocolate, coffee, etc. as a way of educating about fair trade food, and hopefully raising enough funds to purchase the greenhouse in time for an October 10th Global Work Party event. 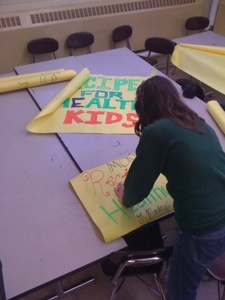 In 2010 Youth CAN hosted a lunch menu contest open to the whole school asking them to submit a healthy cafeteria lunch menu. The entries were posted across the front of the dining hall and then all three lunches voted on the menu they liked best. Each entry had to use local food and be healthy (we gave out guidelines). The winning entry, submitted by Will Osborn of Class V won a $100.00. 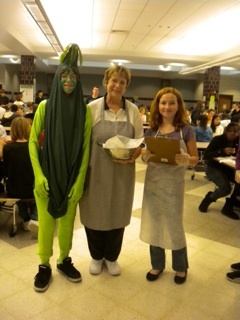 Cafeteria staff will prepare the winning menu for all three lunches in the fall. Green House: Youth CAN is working on getting permission to put up a green house at ground level at BLS (adjacent to the cafeteria) in the fall of 2010. Our hope is to install it on October 10th (If we can raise the funds for it in time), as part of our overall sustainability focus for next year, which is going to be food. The plan is to hold a large event on October 10, 2010 for our participation in the Global Work Party (http://www.350.org/oct10) a day aimed at actions reducing CO2, in which we will concentrate on rethinking school food as well as the green roof push (the green roof effort, as well as the our umbrella mission of educating for sustainability are ongoing Youth CAN initiatives that the focus on food will support. Fenway Coalition Fall Design Charrette: As you may know from the Today Show segment, BLS Youth CAN students formed a coalition with 5 of the ten colleges in our neighborhood around becoming the first green roof enclave in Boston, calling it the Fenway Area Green Roof Student Coalition. 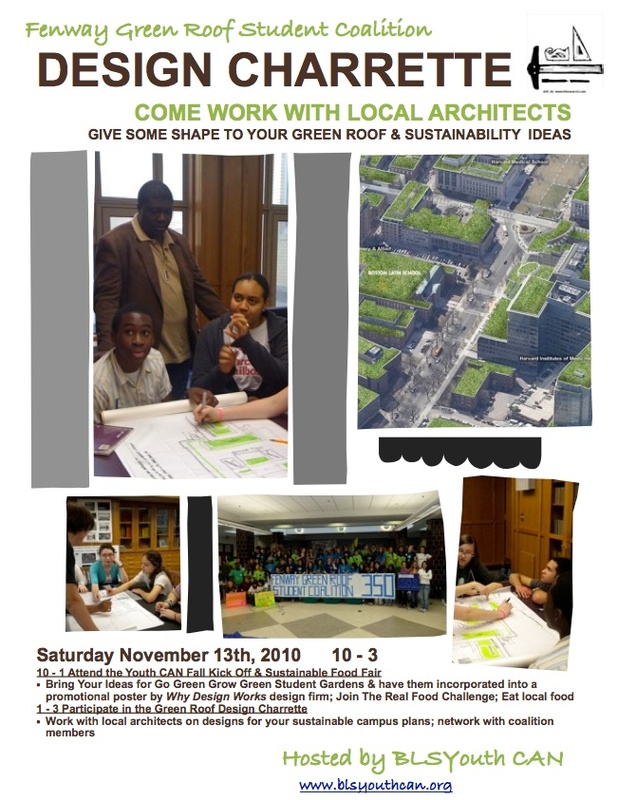 Our plan is to have a green roof and gardens design charrette on October 10th in which all of the Fenway coalition schools will participate. The focus of the charrette will be for each of the schools to design our own individual "Fenway Go Green Grow Green Student Gardens." The ground level gardens will be an immediate way for each school to take action and generate awareness about sustainable food practices at their institution, and also serve as a means of engaging the respective school communities in each group's longer-term goal of building a Green Roof on their school. 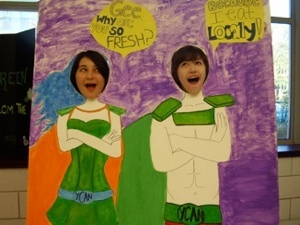 Youth CAN has a series of activities planned to engage the student body in learning about sustainability and food, from school lunch menu contests, tasting events, films, reducing waste contests, poster contests, and more. 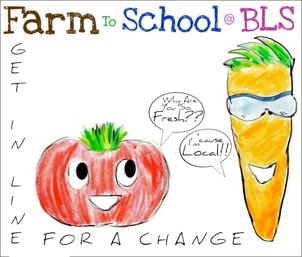 We're also exploring whether or not we might be able to be included in a farm to school program that would bring fresh produce into the cafeteria from local farms. Partners and Support: We have lots of additional support for the overall food effort. 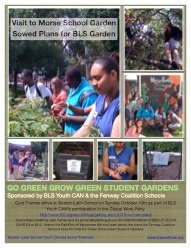 For instance, Bruce Fulford, who is a BLS parent and actually built a greenhouse for Boston Latin Academy (BLS Youth CAN students are partnering with Youth CAN students at BLA to help increase use of their facility and design a "faculty engagement toolkit" that would include steps students could follow for getting their faculty to implement EfS curriculum in general) is more than willing to help. We also have help from Kim Szeto (a BLS alum) who is working on farm to school as well as Laura Zientek who led a food workshop at our annual climate summit at MIT and are a farm to school coordinator. Brad McNamara, who works at BLS is the President of United Hydroponics and is on board with including a hydroponics component in the greenhouse. Jeff Gibbons, who teaches 8th grade ELA, actually went to a workshop on composting, and brought back a vermi worm bin, which he has in his classroom. 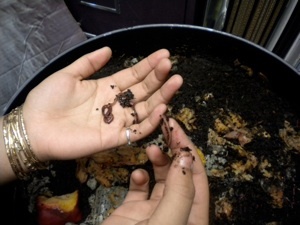 Youth CAN would like to connect a composting dimension to the greenhouse, with a goal of doing composting on a larger scale at BLS in partnership with the cafeteria staff. 1.Freshness. Locally-grown organic fruits and vegetables are usually harvested within 24 hours of being purchased by the consumer. Produce from California can't be that fresh. 2.Taste. Produce picked and eaten at the height of freshness tastes better. 3.Nutrition. Nutritional value declines, often dramatically, as time passes after harvest. Because locally-grown produce is freshest, it is more nutritionally complete. 4.Purity. Eighty percent of American adults say they are concerned about the safety of the food they eat. They worry about residues of pesticides and fungicides. These materials are not permitted in an organic production system either before or after harvest. 5.Regional Economic Health. Buying locally grown food keeps money within the community. This contributes to the health of all sectors of the local economy, increasing the local quality of life. 6.Variety. Organic farmers selling locally are not limited to the few varieties that are bred for long distance shipping, high yields, and shelf life. Often they raise and sell wonderful unusual varieties you will never find on supermarket shelves. Soil Stewardship. Soil health is essential for the survival of our species. Conventional farming practices are rapidly depleting topsoil fertility. Creating and sustaining soil fertility is the major objective for organic growers. 7.Energy Conservation. Buying locally grown organic foods decreases dependence on petroleum, a non- renewable energy source. One fifth of all petroleum now used in the United States is used in Agriculture. Organic production systems do not rely upon the input of petroleum derived fertilizers and pesticides and thus save energy at the farm. Buying from local producers conserves additional energy at the distribution level. 8.Environmental Protection. Soil erosion; pesticide contamination of soil, air, and water; nitrate loading of waterways and wells; and elimination of planetary biodiversity are some of the problems associated with today's predominate farming methods. Organic growers use practices that protect soil, air, and water resources; and that promote biodiversity. 9.Cost. Conventional food processes don't reflect the hidden costs of the environmental, health and social consequences of predominate production practices- of, for instance, correcting a water supply polluted by agricultural runoff, or obtaining medical treatment for pesticide induced illness suffered by farmers or consumers. When these and other hidden costs are taken into account, as they should be, locally grown organic foods are seen clearly for the value they are, even if they cost a few pennies more. 10.A Step Toward Regional Food Self Reliance. Dependency on far away food sources leaves a region vulnerable to supply disruptions, and removes any real accountability of producer to consumer. It also tends to promote larger, less diversified farms that hurt both the environment and local economies/communities. Regional food production systems, on the other hand, keep the food supply in the hands of many, providing interesting job and self-employment opportunities, and enabling people to influence how their food is grown. Passing on the Stewardship Ethic. 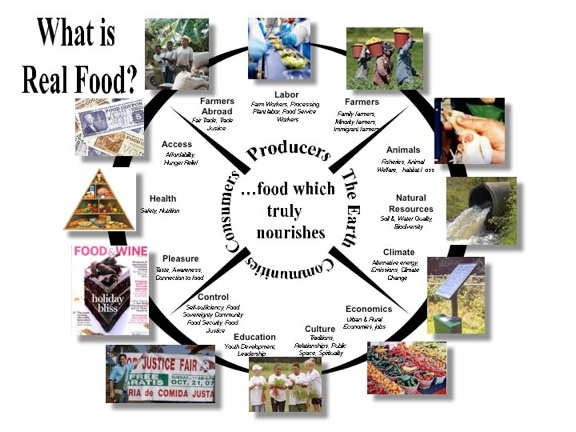 When you buy locally produced organic food you cannot help but raise the consciousness of your friends and family about how food buying decisions can make a difference in your life and the life of your community; and about how this basic act is connected to planetary issues. 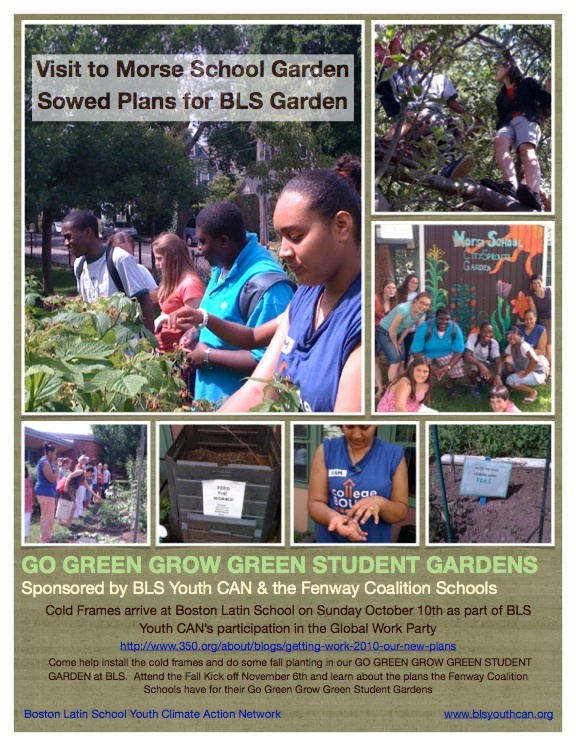 BLS Youth CAN has always been associated with saving the planet from the effects of climate change and “greening” things. But I’m guessing that up until now, most people haven’t associated us much with food. But this year BLS Youth CAN has been focusing on sustainable living as a whole way of life, and realizing that sustainability includes having sustainable eating habits and purchasing. Earlier this year we did some research about the topic and filmed a video for the “Real Food Video” contest in we had to fill in the blank, “real food is…” Some students came up with, “real food is local” and, “real food is sustainably grown” but my favorite phrase was, “real food is eaten by real people.” To me it meant that everyone, including students like us, are taking the actions necessary to make sure that our eating habits are sustainable. After submitting our Real Food contest video entry, we found that we were in the top four finalists eligible for the online voting competition part of the competition. Unfortunately, we only had four days to get people to vote for us, and were beaten by a 6th grade video with singing broccoli! We found out that although we didn’t win because we didn’t have enough votes for our video, the judges said they liked ours best, and said that they would send it to Michelle Obama! We showed the video to alumni on May 8th for the Alumni weekend, and they were very interested that BLS is starting to think about teaching about sustainable habits with food. We took the information that we learned in making the Real Food video and used it to inform our decision to serve organic, vegetarian food from a local business at our annual Youth Climate Action Summit. City Feed & Supply in Jamaica Plain was the perfect choice. They specialize in local and organic products and have a variety of bagels, muffins, and sandwiches that work well for a huge crowd of people. My personal favorite was the “Farmer’s Lunch”, which was made up of Extra sharp cheddar cheese, grain mustard, mayo, sliced granny smith apple, pickled green tomato, and red leaf lettuce on a baguette. There was also a tomato & mozzarella sandwich and a hummus & havarti sandwich. 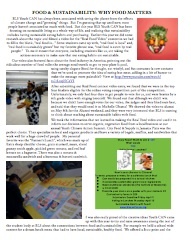 I was also really proud of the creative ideas Youth CAN came up with this year to try and raise awareness among the rest of the student body at BLS about the connections between food and sustainability. 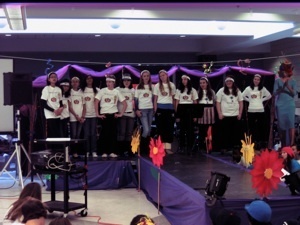 For example we held a school wide contest for a dream lunch menu that had to have local, sustainable, healthy food. We offered a $100 prize and the chance to have the meal cooked for the whole school at lunch. 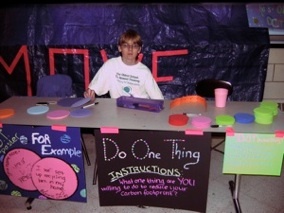 All three lunches voted, and Will Osborn, an 8th grader won the grand prize! 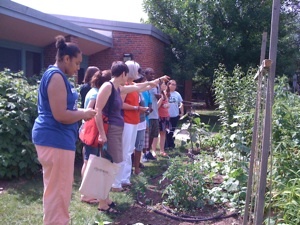 In June we had a meeting with City Sprouts, a community non-profit organization that helps schools with outdoor gardens growing food for the cafeteria and we visited a really cool garden at the Morse School in Cambridge to get some ideas for our own. We also were invited to a food services food tasting in June, where four BLS Youth CAN members weighed in on proposed cafeteria lunch choices! Next year are planning new contests and awareness campaigns to get the BLS student body thinking about and excited about sustainability and food. For example we want to start a waste-free lunch program to go along with the zero-sort recycling program we’re implementing in the fall. As Americans we have come to depend on the many convenience products that are available to us, and nowhere is this more evident than in the school lunch-room. Most parents pack lunch items in single-use plastic bags, aluminum foil, or wax paper, or they purchase single-serving items that come in their own disposable package. Admittedly, these products are extremely convenient, but what is the environmental cost to a country that relies so heavily on them? Landfills are full and overflowing. Incinerators pump contaminants into the air. Communities are battling over who will accept the nation's trash. We all enjoy these conveniences, but few of us are willing to allow new landfills and incinerators to be built in our own backyards. Our waste free lunch project will educate and challenge students, parents, staff and administrators to know more about where trash ends up and how we as individuals can reduce the amount of trash we generate. The goal will be to significantly reduce the amount of packaging and disposable waste in our school lunches. We’ll also have more contests about creating healthy local lunch menus, estimating food miles, and more. We even applied to a program that matches schools with a local chef to design interesting meals. Another really exciting thing we’re planning is participating in the Real Food Challenge, and use their Real Food, a tool to track institutional food purchasing. Though designed for colleges and universities, this tool can be used by any institution, such as a hospital, corporation, or municipality. The website encourages students to use this tool as a platform for discussion and action with dining services and administrators. It's a great way to get an inside look at dining service operations, to keep tabs on campus purchasing, and to make a quantitative goal for getting more real food on campus! Several of us are going to a summer training hosted by the Real Food Challenge in August. Over all I feel that the way we focused on food this year truly reflected a main attitude of Youth CAN: Live healthy and Sustainably! I think we began to teach people to pay attention to what they do with food and think about how it impacts their body and the earth. Know where your food comes from, know how it is grown, know what’s in it and whether or not it’s good for you, and know who and what it supports (or harms) when you buy it! I’m even more excited about our plans for next year! Click the Images Above to download the files. Download our Food Menu Contest flyer here. 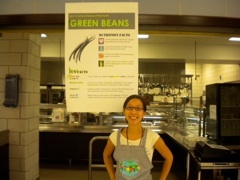 Photos from when we featured Local Green Beans. Click here for more. 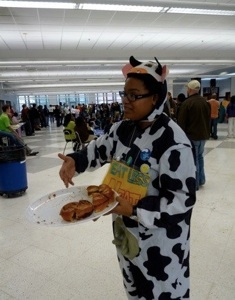 On November 13, BLS Youth CAN Hosted a sustainable food fair with more than 250 people in attendance. We promoted healthy habits and understandings about food with displays from local service organizations, educational games, food to sample, entertainment, and activities. 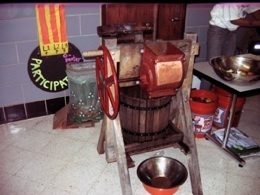 At the food fair, we had Hand-Powered Veggie Smoothies, an Old-Fashioned Cider Press from Earth Works making fresh cider using apples from Carlson Orchards, a local farm. 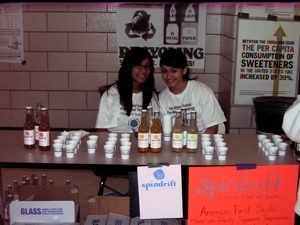 We also had Fair Trade Coffee and Chocolate, Spindrift Soda and lots of food to sample. 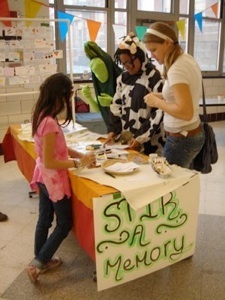 Heifer International hosted a display with information and a game about food justice. The Boston Collaborative for Food and Fitness had a display about their Go 4 Fresh campaign with youth manning the table. Corporate Accountability International had a display about the Think Outside the Bottle Campaign. The Food Project brought youth leaders who ran mini workshops about the work the organization is doing. 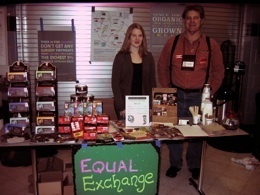 Equal Exchange also lead mini workshops. Lots of BLS families contributed special dishes prepared with local foods for the food fair, including kale chips, veggie burgers, and more. We also had pumpkin carving. Pumpkins were donated by several local farms. 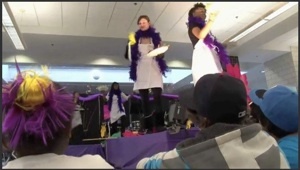 Youth CAN students also put together a Fantasy Lunch Food Fashion Show featuring dishes we hope to see in our ideal cafeteria lunches of the near future. It was a huge success. BLS Step Squad came and led attendees in a group step, which was recorded with everyone wearing Michelle Obama headbands, as part of the invitation for her to attend the 2011 Climate Summit at MIT. Click here for the Video. Knockdown, Food Journey Jump, Healthy Food Tug of War, Food Power Twister, 350 Target Practice, Toxic Pesticides Keep Away, the GMO 3-Legged Race, and more. STIR A MEMORY came to the food fair and made wonderful postcard keepsakes about people’s food memories, emphasizing the connections and power that food has in communities to shape our stories. We gave tours at the food fair of our recently planted student culinary garden and later in the day encouraged colleges attending the Fenway Green Roof Student Coalition Design Charrette to plant their own Fenway Go Green, Grow Green Student Gardens on their respective campuses. 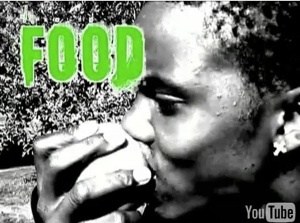 At the food fair, we screened Food, INC., Trashed, Flow, Food Matters, and Blue Gold. Youth CAN will be offering these films and more periodically throughout the school year as part of our monthly educational film series in room 025. Watch for posters announcing the film dates. Popcorn will be served. Congratulations to L. Tang and S. To for their award winning posters promoting student culinary gardens. 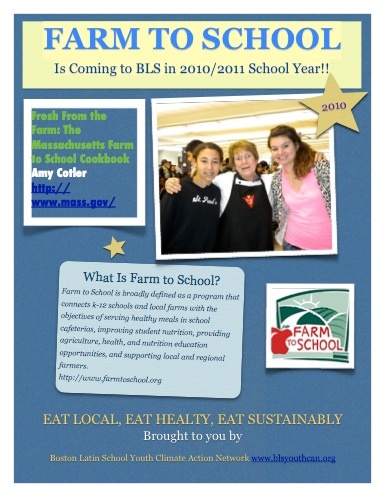 Check out the Farm to School T-Shirt design by Lily and Michela, BLS Class of 2012. 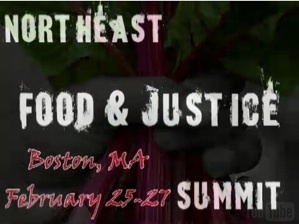 BLS Youth CAN partnered with the Food Project and the Real Food Challenge in planning the Northeast Regional Food and Justice Summit in February. Click here for their website. 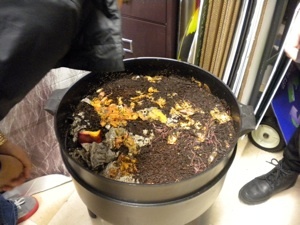 Composting - We’re doing a trial with red worms! Cooking Up Change at BLS! What if lunch was longer? What if instead of just pizza, we had fresh burritos & caesar salad wraps in the lunch line? What if every Thursday, there was something new on the menu fresh from a local farm? 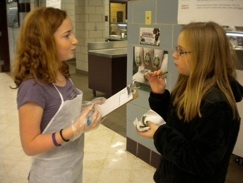 BLS Youth CAN is working towards lots of improvements to school lunches. Starting in this Thursday, October 21st, the farm to school pilot will bring farm fresh green beans to the lunch line, and the BEAN is just the beginning! In November, every Thursday will feature a new farm fresh item. Support these changes and support the Farm to School Pilot by trying this week's green beans and giving us your honest feedback when asked. Get in line for a change!! 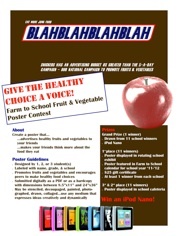 Give the Healthy Choice a Voice! 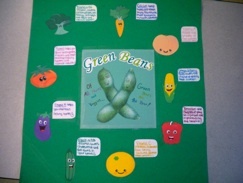 Enter the Farm to School Fruit & Vegetable Poster Contest and win a Prize. Click to the left for more information! Snapping me to attention with every bite. I love your curly tails. I delight in your little bean-y pods. Oh what joy when I eat a green bean! What made you so green, my beloved bean? I wonder this as I munch thoughtfully on you. You even taste green, I think you’re the only thing that does. Do you like being green, I wonder? We had a Fantasy Lunch-Food Fashion Show! What would you dream up for an ideal healthy lunch? Here are the descriptions of our ‘dishes’ who walked the runway! Mermaids Move Over! Cafeteria managers on the cutting edge this season are making a big splash with everyone’s favorite gift of the sea: Clam Chowder. This dish is so fresh and full of goodness it’s as if it sprang straight from Neptune’s kitchen. You could write a symphony about the tender new potatoes as they compliment the creamy broth. Your spoon will get blissfully lost in the abundance of plump juicy clams. Sponge Bob himself would be proud of the way his underwater pals have dressed up this delicious lunchtime staple. Ole! And Holy Guacamole - This burrito looks so good it isn’t decent. See how the rice teases the tomato. Glimpse the tasty beans and lettuce peeking out from their warm embrace. And that grilled chicken is so fresh it should be slapped. The delicate touch of the sour cream………shamefully decadent! But we aren’t complaining. With lunches this good, everyone’s mouth will be watering. Los burritos parecen muy calientes! Ciao, Pasta fans one and all. Check out this next dish, and brace yourself for a real Italian romance. Our spaghetti and meatballs is a love affair reborn. With light, yet pleasingly plump meat-balls flirting on a bed of al dente spaghetti – this is a union that was meant to be. Aren’t they sitting pretty under a sprinkling of fresh parmesan? And who wouldn’t be, swimming in all that gorgeous red sauce. It’s a beautiful marriage of everyone’s favorite duo. Here’s to a love that never gets old! Buon Appetito! Ooo La La Cherie! Greens Lovers are in for a real treat when your favorite, and mine – the tender slender stalks of fresh young broccoli dress for success. Looking smashing in a delectable freshly grated cheese sauce, you can only say “Be still my heart” as you catch glimpses of the tantalizing flowerets peeking out from beneath their blanket of glistening golden cheese. Now that’s what I call a good use of texture and color. Try not to drool gentlemen. A tout a leur! Ladies and Gentlemen, tell your taste buds to sit up straight. A summertime diva has taken the stage. The classic elegance of this fresh fruit salad commands the respect of everyone’s palate. Our dish is absolutely bouncing for joy, and why not? The vibrant fruits scream youthful, perfect for the spring and summer season. As our dish turns, notice the succulent banana and watermelon, practically splashing with sweetness. And to top it all off, some crisp apples for the perfect blend of edginess and unpredictability. Our dish is urban, sassy, and fresh. What more could a healthy lunch hope for? Fresh Tomato Soup! What a bold choice. See how this rich savory dish almost flaunts it’s robust accents of red tomato-y flavor. Now that’s how to demand attention. Take that McDonalds! Move over boring burger! This healthy vegetable alternative is a great answer to lunch as usual. With a playful parsley garnish that lends just the right dash of spice to the monochromatic color story, this yummy dish will warm you through and through. Wake up fun lovers. Feast your lunch-time eyes on the most tantalizing California rolls ever. This vegetarian beauty is one cool cucumber wrapped up nice and snug in a delectable layer of sticky rice and wearing a sleek sophisticated outer wrap of seaweed. Your taste buds will sing at the synergy – a sultry dance between the smooth cool avocado and the sassy soy sauce. Who knew beauty and brains could make for such a great lunch date? This is California dreaming at it’s finest. Friends, Romans, Caesar Wrap lovers, it’s time to render unto Caesar that which belongs to Caesar. This spectacular dish has set its sights on some of the tastiest freshest ingredients ever brought together in one delicious wrap. These mouth watering grilled filets are too tender to talk about in public. The fresh garden lettuce and crispy croutons provide a gorgeous backdrop for the star of the ensemble: a zesty Caesar sauce that trumpets its love of garlic loud and proud. This surprising medley of flavors couldn’t get any more appealing if it sang you a lunch-time love song. E tu Brute? Enjoy the sweet harvest flavors of autumn in our perky pumpkin sage ravioli. This smart southwestern combo showcases an elegantly nuanced pumpkin sauce folded into a creamy ricotta underpinning. Tuck this mouthwatering mix into steaming pillows of pasta and you’ve got the perfect recipe for a lunch to remember. Doesn’t this dish just cry out to tasted? And the tart granny smith apple slices are the perfect unexpected garnish. How to keep them looking your way Ms Dish, AND asking for more! Who doesn’t love a long lean noodle shimmering with creamy sauce? This is pure pleasure comes to you direct from the old country. An Italian beauty featuring long-legged linguini guaranteed to get lingering looks from everyone at the table. Sporting a confidence only the most delicious dish can carry off. All toped off with a sinful white sauce – your lunch time experience will be drenched in guilty pleasure.